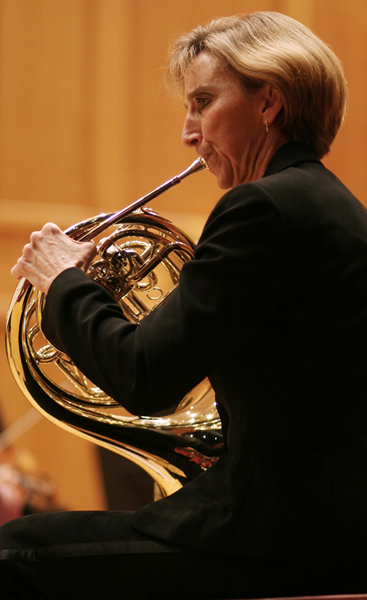 Perhaps the highlight of the evening was Anne Sexton's french horn solo during Wolfgang Amadeus Mozart's Horn Concerto, No. 3. The Chamber Orchestra’s principal horn player and Wabash music veteran performed beautifully, smiling at the conclusion of the piece as she accepted the congratulations of her conductor, then flashing a thumbs up sign to friends and family in the audience during the prolonged applause. Comprising a remarkable blend of Wabash students, faculty, and members of the Crawfordsville community and joined for the concert by guest concertmaster Jesse Hawkins, the orchestra opened the program with Mozart’s moving Overture to Don Giovanni. In the audience Sunday night were Wabash President Pat White and First Lady Chris White, still shaking off the cold after driving back from the football team’s game in the snow and ice against University of Wisconsin-Whitewater. "If we had any doubts about attending tonight’s concert, the email by [Chamber Orchestra violinist] Juan Carlos Venis saying how good tonight’s performance would be certainly would have changed our minds," said President White. Added Chris: "It’s such beautiful music."